We rely on a lot of repeat business and recommendations and have many satisfied customers. 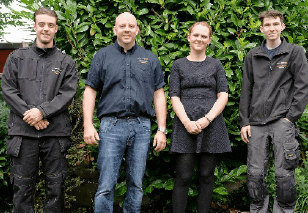 Established in 1996, owned by Gary Edmondson, if you require cost effective, reliable heating and plumbing engineers then look no further. We cater to all domestic and business customers central heating systems, gas services and plumbing requirements. 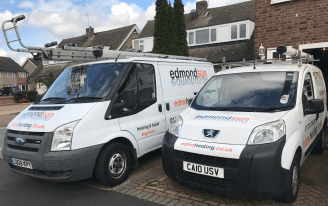 Edmondson Heating & Boiler Installations work throughout the Upminster area. Gary Edmondson started a NVQ in plumbing and heating in 1992, and since then I have remained in the heating installation industry. In my many years of experience I have conjured up many qualifications including; NVQ Level 1-2 in plumbing NVQ Level 3 in advanced plumbing and gas CORGI registered from 1996 until present which is now Gas Safe Edmondson Heating and Boiler engineers have two qualified engineers, an apprentice and one member of staff in the office. We specialise in domestic central heating and boiler installations, we install the best product from the markets leading Worcester Bosch boilers with a 10 year full parts and labour warranty, to replacement Grundfos central heating pumps and Honeywell heating controls. We are experts at boiler servicing, were we take 50 minutes to complete your boiler service, including a 19 point check and we test your existing gas systems for any leaks. 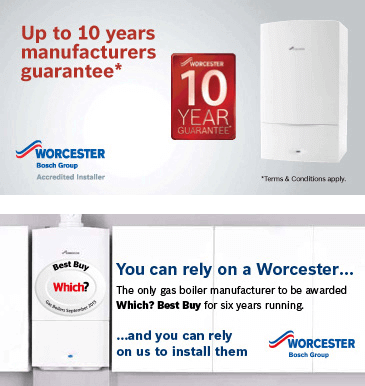 We are Worcester Bosch approved contractors and we install around 70 boilers per year which comes with a 10 year guarantee. Unlimited labour and parts. We are also members of Checkatrade where we average a 10 on our recommend reports. Gas tightness test, this is to check for gas leaks. Gas meter let by test, this checks that the isolation valve at the meter does not leak. Operating pressure at the gas meter, this is to check that the gas flowing into your property is the correct amount of gas required for your appliances. Operating presure at the boiler, this is to check that your gas pipe running from your gas meter to your appliance is of the correct size. Gas rate test, this is to check your boiler is running at its correct gas rate. Calculate the presure drop across your pipe work, this is to check the friction drop across your internal gas pipework is not greater than a 1 millibar drop. Heat exchanger value test, this checks that the heat exchanger is not blocked or damaged. Check chimney termination is correct. Clean magnetic filter of all debris. Combusion Analyser testing to check CO2 and Carbon monoxide levels. We will lay sheets where we work. We take 50 minutes to complete our service.